On Tuesday night, Oct. 30, Liberty students witnessed Thanos reading out winning raffle tickets and the gingerbread man handing out earwax. It was the annual Manager Cook-off at the Reber-Thomas Dining Hall and the managers let their creativity run wild. 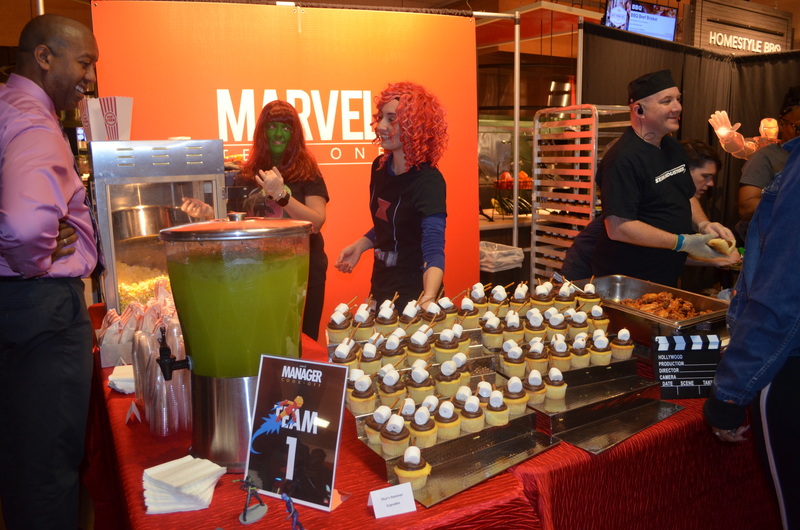 Music from the “Toy Story” films sounded over the speakers, “Thor: Ragnarok” played on a flat screen TV and the lines of students waiting to sample food wound around the dining hall’s central space. The theme of the night was films, and there were four teams of randomly selected managers decked in costumes and proffering similarly themed food. The Marvel supervillain overseeing raffle tickets was Human Resources Manager Russell Irby sporting purple body paint. Students took pictures next to him and cardboard cutouts of Thor and Iron Man and walked away with cupcakes topped by marshmallow-and-pretzel-stick Thor hammers. Barry Spence, dressed as Woody the cowboy doll, was carving slices of “Little Bo Peep’s Lamb Chops” while “You’ve Got a Friend in Me” played overhead. “It’s a little messed up if you think about it,” Spence said, referring to the idea of Little Bo Peep having lamb chops. The “Shrek” table around the corner was especially creative in labeling their dishes. Dips were “swamp slime” and guacamole was advertised as “pureed lizard.” At the end of the line, a manager completely enveloped in a gingerbread man costume offered marshmallows on a stick drizzled with green-dyed white chocolate. “Want some earwax,?” she asked each student. 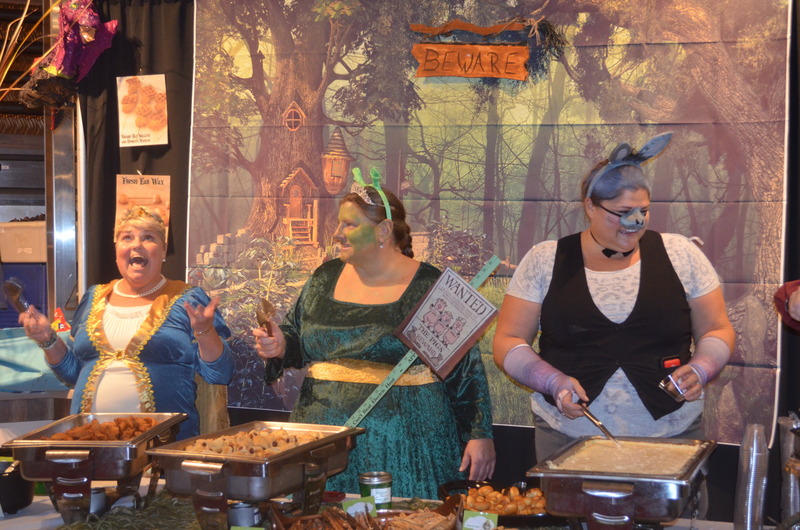 Near the beginning of the night the “Shrek” table seemed especially amused with their seemingly repulsive spread. “Earwax!” the team cheered. “Wooo! Earwax!” The gingerbread man lifted its arms as if in celebration. The hall was filled with banners, prizes, costumes and props. Spence explained that the teams were given a budget to spend. The teams were given a couple months to plan, but it took coordination to have all the food served fresh at the same time. Besides different kinds of meatballs, students who visited her team’s table could also make punch floats topped with animal gummies. The edible sharks and octopi rested on the scoop of ice cream as if on an iceberg in a blue punch sea. Proficiency in managing does not necessarily mean a proficiency in food prep, something the “Marvel” had to work with. But, overall, the managers seemed enthusiastic. The next day the winners were announced on social media. The prize for best presentation went to the “Shrek” table, while the “Toy Story” table won best taste and best overall. Keep up with Liberty Dining events through their website, Facebook or Twitter.